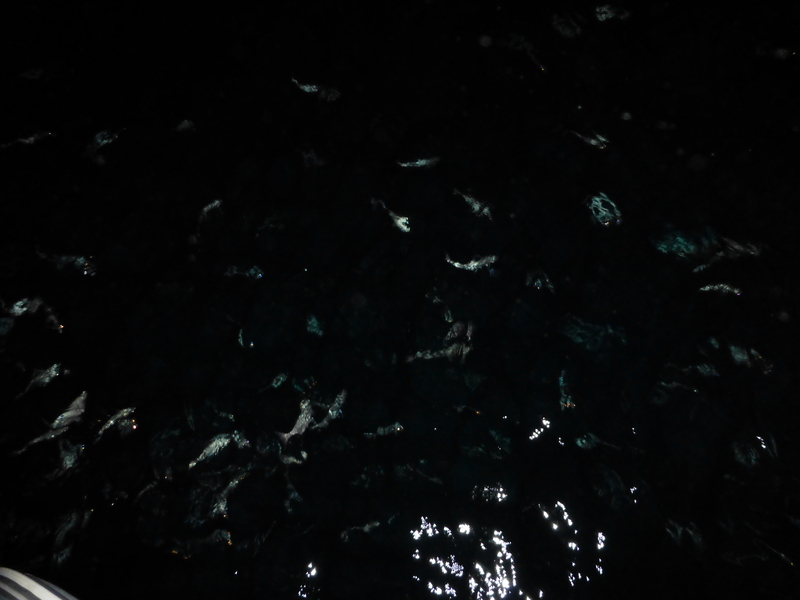 The desert is like the ocean in a lot of ways, but usually you don’t see dead stuff in the ocean. Dead things are usually food for live things. Clearly you can see the humerus and radius and ulna. But the bones are too light for mammals. You don’t nap on the beach in Baja. Two young Aussie adventurers from Sonrisa (www.sailsonrisa.com) helped us discover this dead thing the other day. As far as I can tell from Wikipedia it used to be a young white sperm whale. 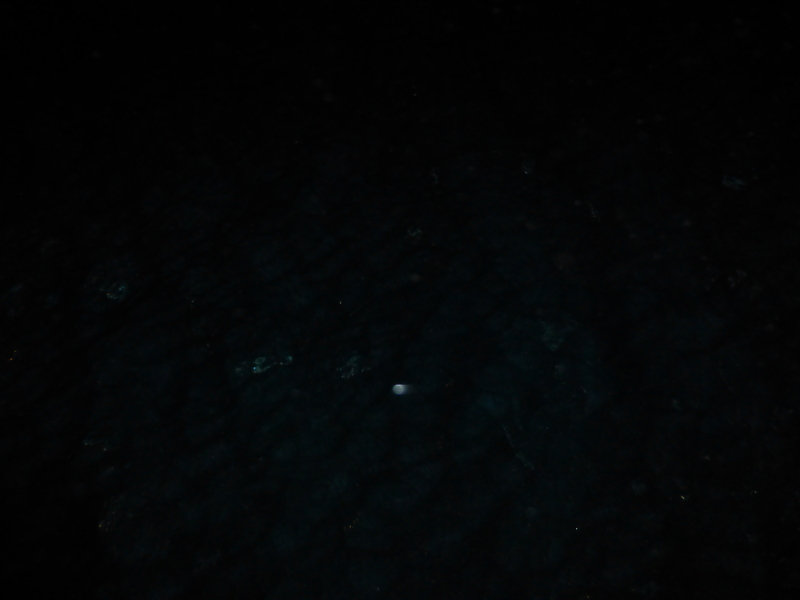 It’s too big to used to be a dwarf or pygmy sperm whale. It’s been dead for a while, as the skeleton has softened and the tail turned. However, the skin is mostly intact with only a few bird holes. There were no shark bites we could find. It did indeed stink. Nancy found some spermaceti on the beach. It stunk too. Our 66 pound anchor was stuck in the anchor roller. Weird, and substantial due to the awesome force of our massive Le Tigre anchor winch. So I leaned over the one-inch diameter pulpit rail and pushed on the anchor fluke. Nothing. Pushed a little harder. Nothing. Pushed one more time. Clunk snap crash. Clunk was the anchor un-wedging from the roller housing. Crash was the anchor dropping three feet before the chain came tight. Snap was the pulpit rail wedging between my ribs and snapping one of them. 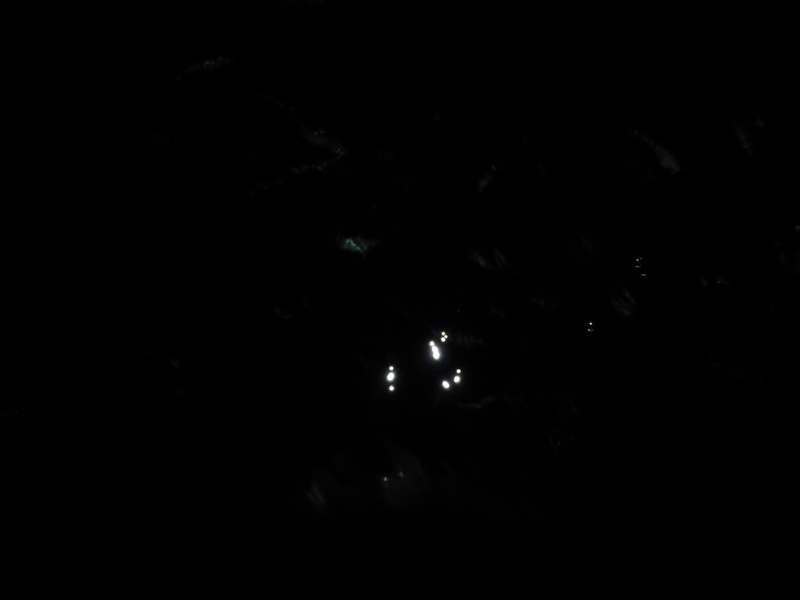 It was a fairly clear noise. Not a lot of ambiguity. We immediately cleared the deck and headed for La Paz, 85 miles away. At six to seven knots, that’s, umm, quite a while. We got out the first aid books and treated me for shock and reviewed the boat procedures and lined up medical supplies and iced the area. It scared the crap out of us. Once I didn’t start coughing up blood or passing out, it got boring. Still scary and painful, but boring. This is what a normally too skinny rib cage looks like. This is the right side with the more interesting but hideous hole/bump malformation. Here in Baja we use frozen sushi-grade tuna for rib ice-packs. It’s traditional. Cheaper chicken freezes too hard and hurts. Good thing I had my Kindle. I finished the Sherlock Holmes collection. At least the moon was pretty. Must be a harvest moon, heh? We docked in La Paz at 11 pm. This morning the La Paz medico looked as this pretty picture and declared me healthy but sore. Since you can’t even see the front ribs I’m a little unclear on his criteria. However, I’m pretty sure the break, if it does exist, is just a crack. I can feel it grind if I move around too much. Must be my imagination. So Nancy gets to do all the heavy lifting for a while. Good thing her back is good. That cove in the lower left corner is La Paz. 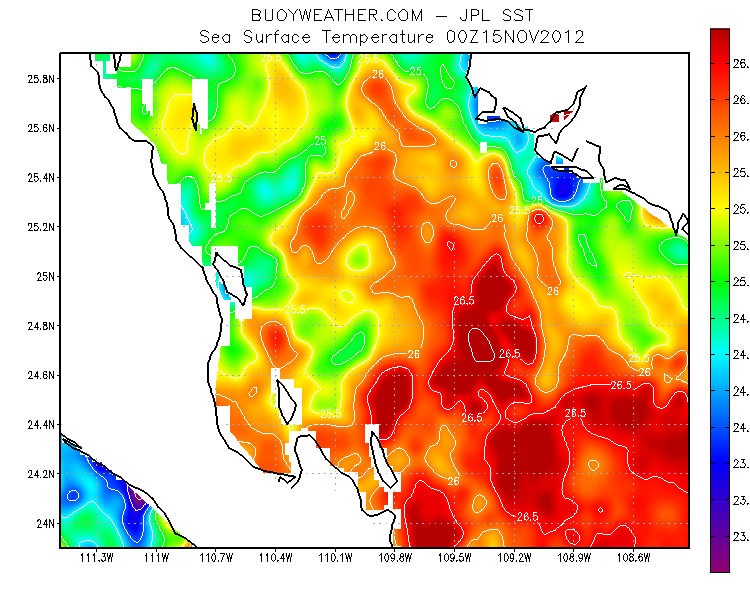 Three weeks ago, the entire sea of Cortez was red (red=warm=good), but I didn’t save the image. I didn’t think I had to. Then, twice, Arizona and SE California had some nice weather for a few days. The high pressure leaked out through the Grand Canyon and Lake Mead into the Sea of Cortez, causing 25-30 knot winds right down the chute. The strong winds blew the warm water south, and colder water welled up to the surface. 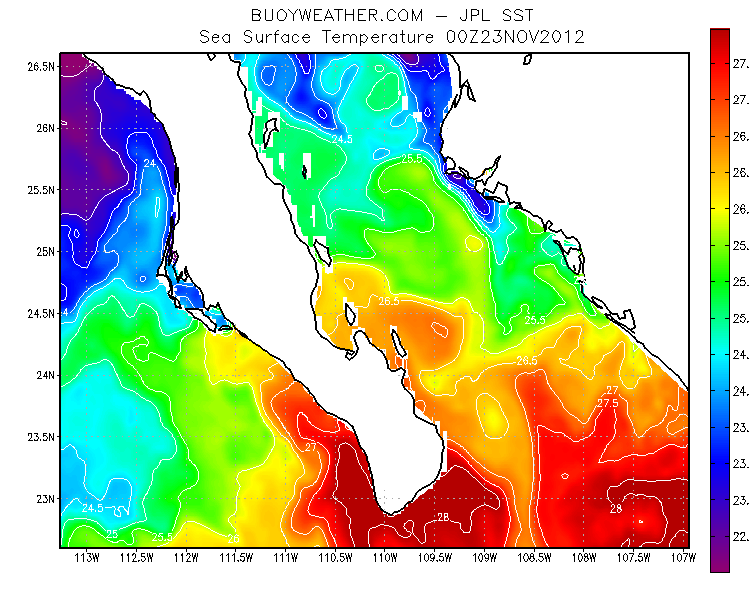 This is the lower Sea of Cortez now. 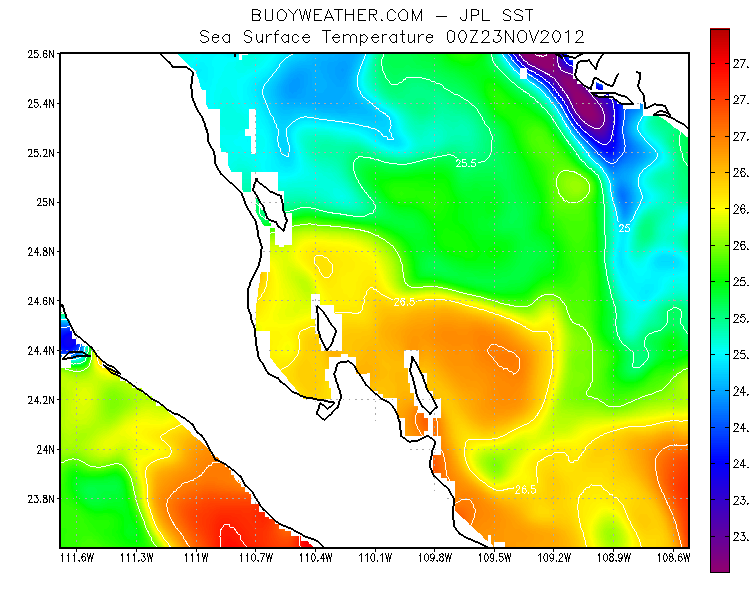 One more “Norther” event, due to start on the 30th, will drive all the warm water from the Sea. It will then be cold/cool (65 or so) until July. 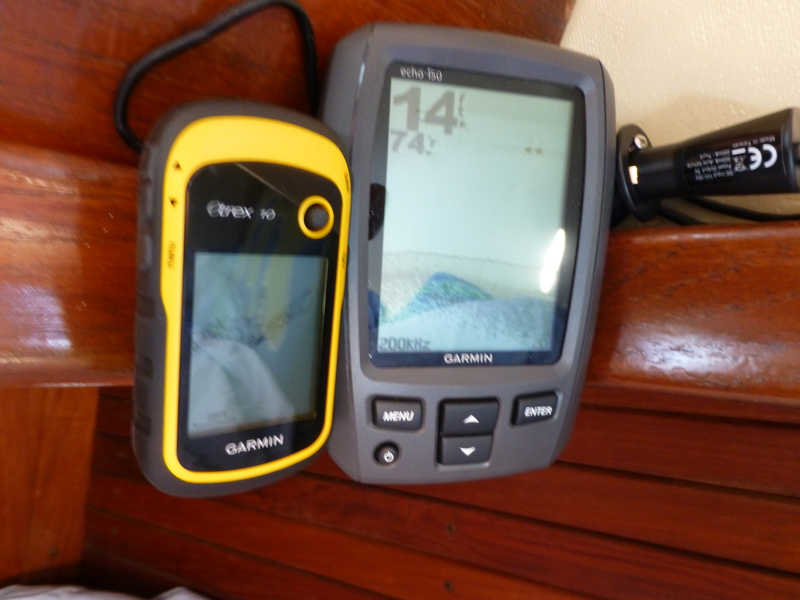 So when we get back to the boat after Christmas/New Years, we will continue south to the Puerto Vallarta area. Dunno the details. I just know we won’t stop until the water is red. I think it’s clear that the best way to do laundry is to not do laundry. Eventually this catches up with you. 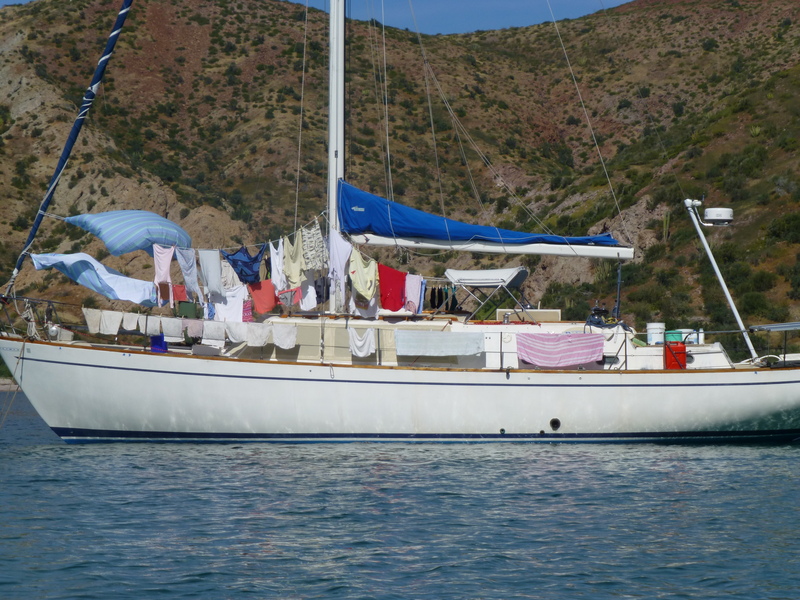 So yesterday (Thanksgiving, actually) it was hot and the wind was light, the anchorage was empty, and we were low on clothes. So we did some laundry. 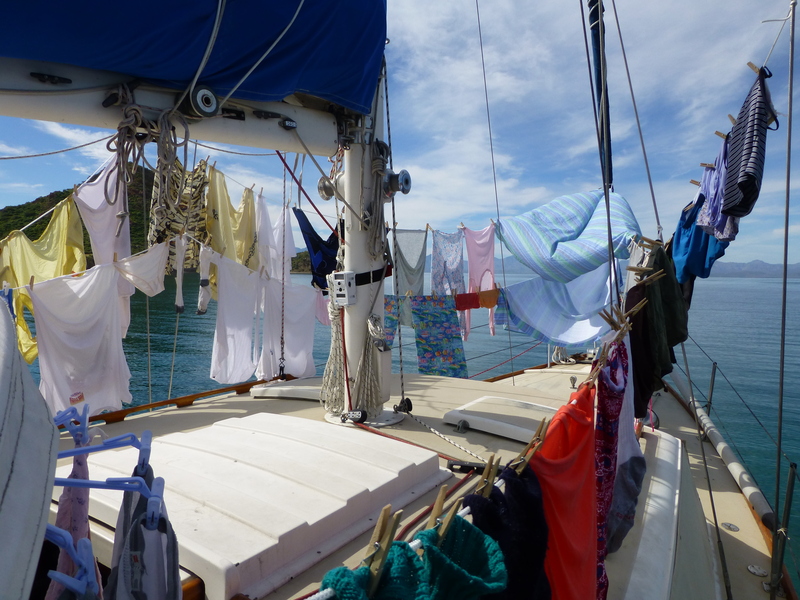 Boat laundry is simple, but hard. Soak/agitate in the soapy bucket, then wring and into the rinse bucket, then wring and hang. The wringing is the hard part. Soon you throw out the wash water, add soap to the rinse water, and start a new rinse bucket. We ran out of clothespins. The more observant readers have already guessed what happened next. Some poor couple on vacation paid a pangalero to drop them off on a lonely beach on a desert island. They got an authentic view of paradise. 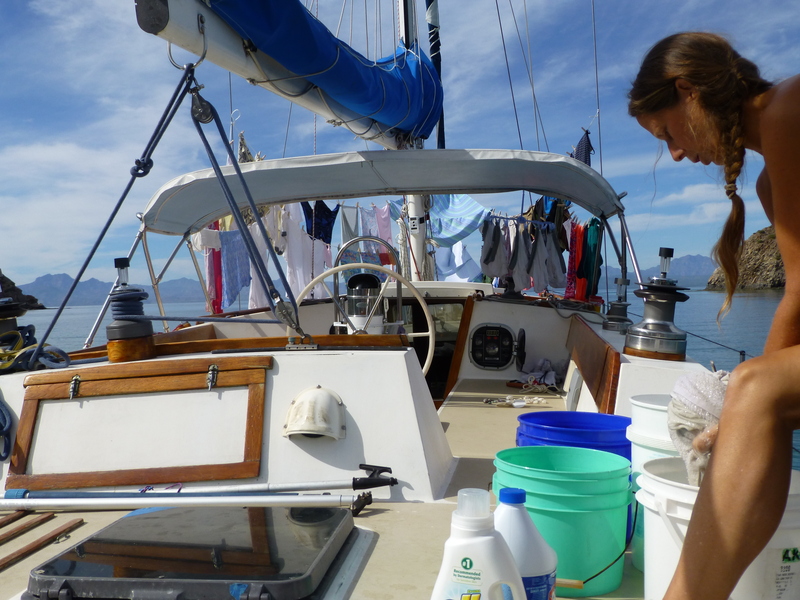 Some are wondering: “They live on a boat, how can their clothes get dirty?” Here’s a clue: Six weeks ago the rinse water was white, almost pastey looking. Now it’s a golden tan color. Fiberglass boats are built in molds. The outside of the boat is the inside of the mold, so the outside surface is smooth and clean and finished. The inside surface of the fiberglass is somewhat rough, showing the fiberglass fabric and drips and drabs and joints and stuff. 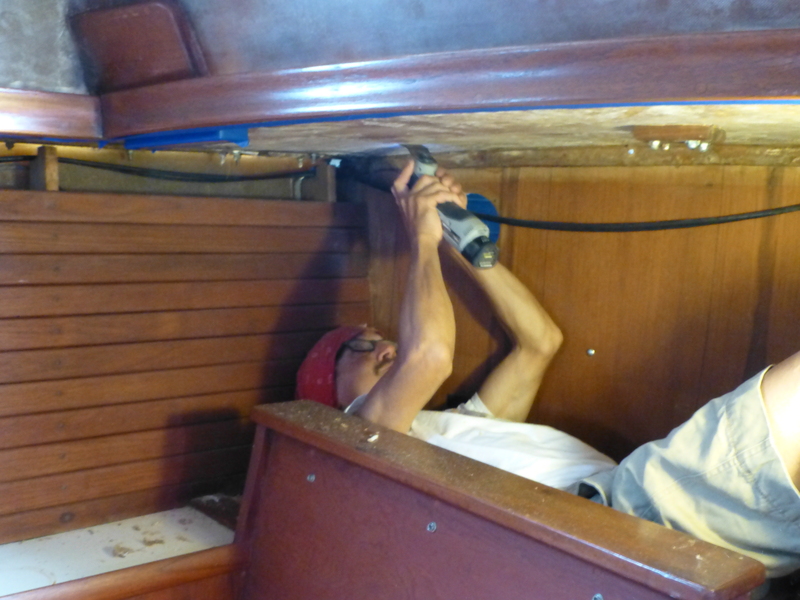 Modern expensive boats install false panel over the entire inside of the boat, usually vinyl or fabric covered. These panels are hopefully removable so you can work on the wiring and plumbing and mildew they cover. Modern inexpensive boats install “monkey fur,” a cheap non-woven carpet that is contact-cemented to the inside of the hull. Often the stuff is glued right over wiring and plumbing. One benefit of monkey fur is that it sort of breathes and is sort of mildew-resistant, so unless your boat is really, really wet the condensation will hold in the fur until it evaporates, without growing too much mildew. 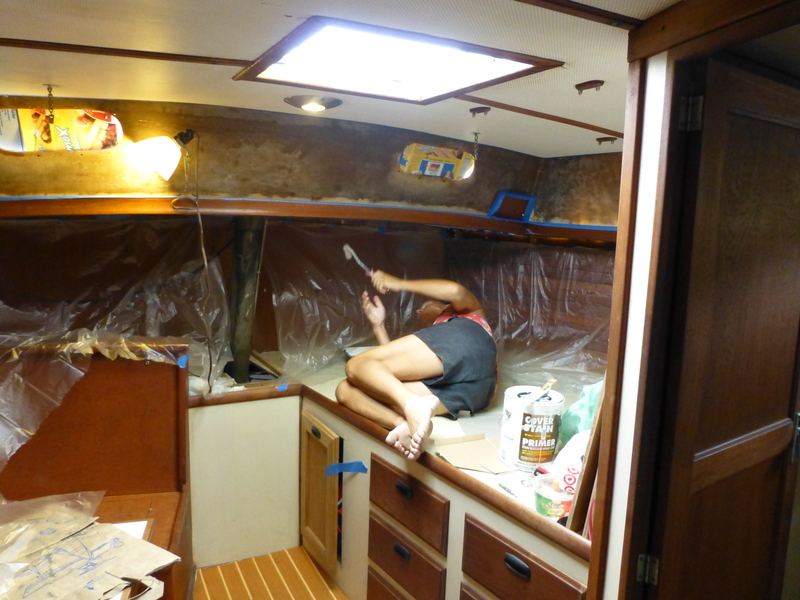 Our boat had lots of the interior surfaces covered with sheet vinyl contact cemented to the inside of the hull. Not only is the vinyl non-breathing, but the contact cement is a food source for mildew and other living forms of death. Also, the contact cement has mostly failed and the vinyl is sagging. We do not approved of sagging on this boat. 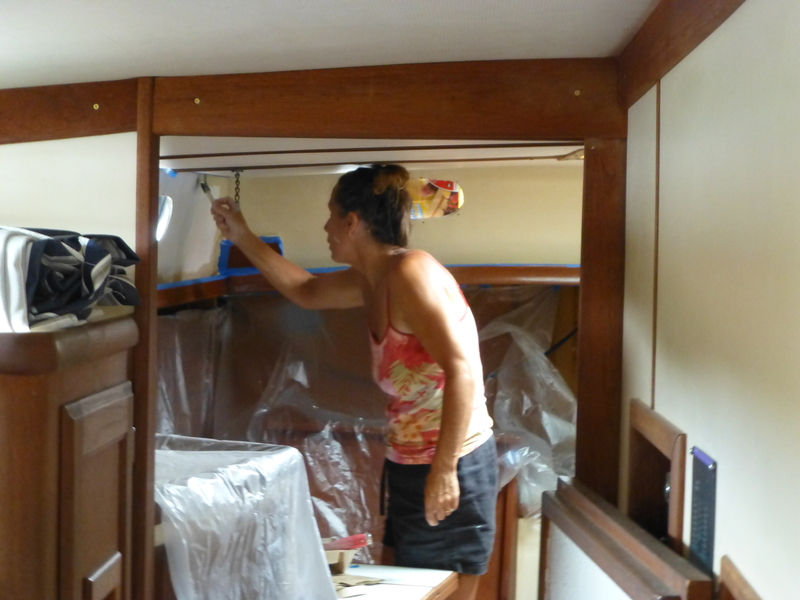 Nancy has done most of the work removing the vinyl from our boat, but I got to help with this last push to get the stuff off the aft cabin overhead. 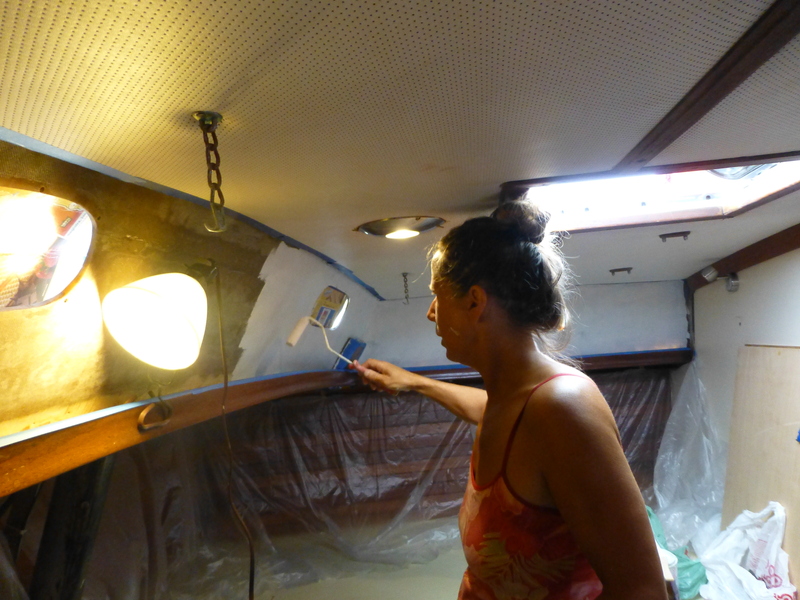 We pulled the portlights, peeled the last of the vinyl, then scraped and used chemicals to get down to clean fiberglass. If the boat was still in a yard and we weren’t living on it, we might have squeegeed on a coat of filler, then sanded it really smooth, but probably not. Jensen Marine did a pretty good job with the fiberglass and it’s a paintable surface. …then finished with a semi-gloss oil paint in almond, to match the ’70’s vibe. 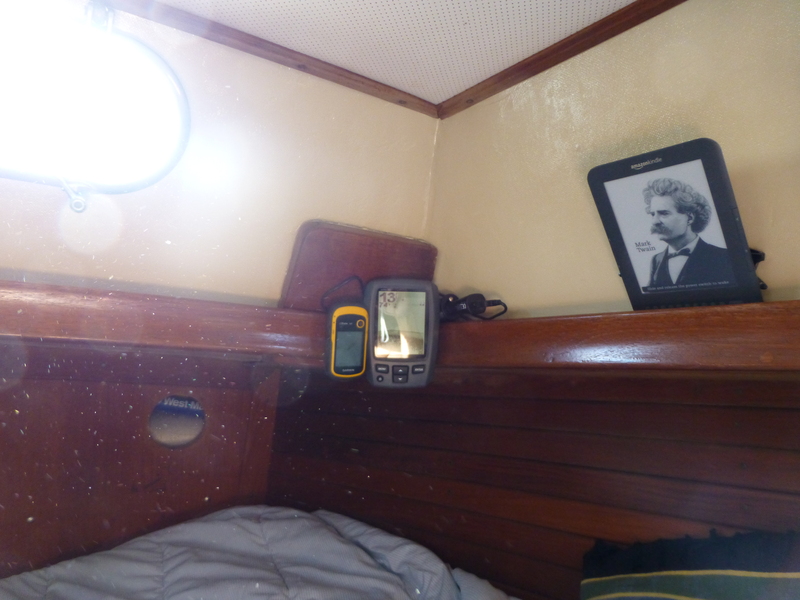 We re-installed and re-bedded the portlights, and WHAM! A practically new boat. Average speed underway: 5.6 kts. Ran motor one day to charge batteries. Two friends came to visit. Please let us know what you want to hear about. Up for one last check on deck before bed, we heard a burbling from the water. Gimme the camera, I says. Wow! I’ll take another picture. Hey Nancy, come see this! (Short delay). 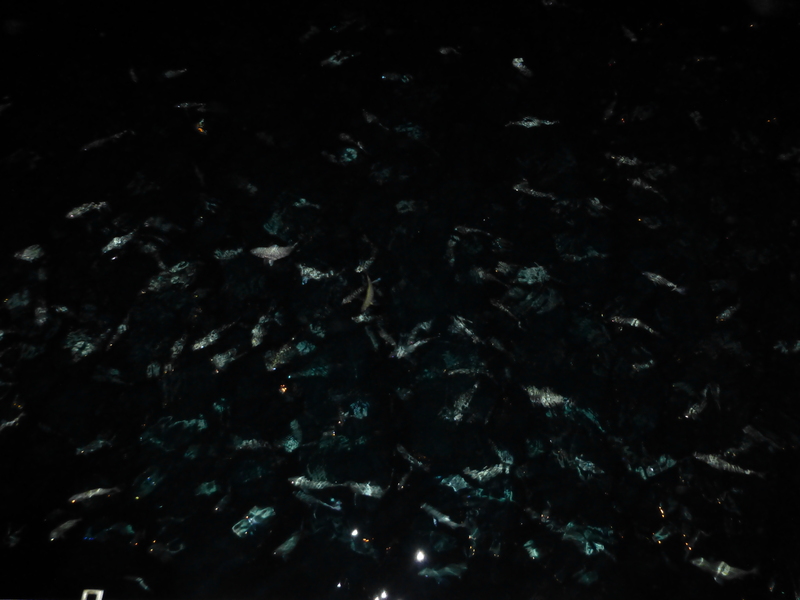 After a little web research today, I found that the Sea of Cortez is completely full of these fish that turn transparent when exposed to light. The effect wears off after a minute or so.